Starting with a new board the first step is to plug the board into your laptop using the mini-USB cable provided. The BeagleBone has two USB ports, a full sized USB-A port, and a mini-USB port. The mini port is located on the reverse side of the board near the Ethernet jack. The board should boot and you should see a solid blue light next to the 5V power jack. When startup is completed, a new mass storage device called BEAGLEBONE should appear on your desktop. Open up the mass storage device and click on the START.htm file to open it in a browser. You should probably read through this file to familiarise yourself with the BeagleBone's capabilities. If you do not want to go through the manual installation steps below we supply a disk image for the Beaglebone Black. The disk image is the latest version of Debian Wheezy with the steward and its dependancies already installed. The steward will auto-start when the Beaglebone is booted, although especially on the first boot it may take a few moments to start as it has to generate an RSA key on startup. Download the disk image, and install it as you would a normal version of the operating system. NOTE: You should use the mini USB port on the underside of the board to connect the BeagleBone to your computer, this is located on the underside of the board to the left of the Ethernet jack. NOTE: The board uses the same power supply as the previous BeagleBone. 5VDC, 1A, 2.1mm, center positive. The power supply is not supplied with the board. However if you are going to configure the board to use a WiFi adaptor you should use a supply with a 2A rating otherwise you'll get intermittent crashes due to brown outs. 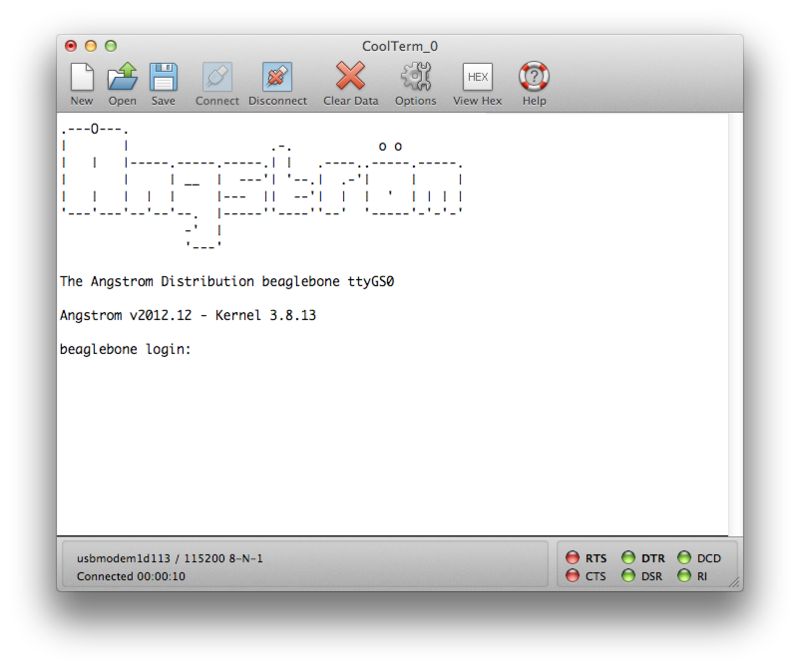 The BeagleBone Black ships with a copy of Angstrom Linux on the internal eMMC. While Angstrom isn't a good platform to run the steward, we do want to install both Network and Serial drivers for Mac OS X before we go ahead and swap out our operating systems. The first gives you network-over-USB access to your BeagleBone, the second direct serial access. You'll need both sets of drivers. Plug the board into your computer using the USB cable, wait while the board boots. Open up the BEAGLEBONE volume and click on the START.htm file, go to Step #2 in the file. Grab the Network (HoRNDIS-rel4.pkg) driver file from the BeagleBone's mass storage device by clicking on the link in the START.htm file. Install the driver on your Mac by clicking on the pkg file and following the instructions. After installation you should at this point be able to access the onboard web server of the BeagleBone Black over the USB cable by going to http://192.168.7.2/ in a browser. NOTE: In some cases you may not be able to directly access the board using SSH at this point. There seems to be a problem in some versions of the stock image that causes some boards to fail to bring up the SSH server properly. Grab the Serial (FTDISer.dmg) driver file from the BeagleBone's mass storage device by clicking on the link in the _START.htm file. Install the driver on your Mac by opening the dmg file and clicking on the enclosed pkg file and following the instructions. NOTE: The enclosed driver is a patched version of the stock FTDI drivers. Even if you've installed FTDI serial drivers before you need to follow this step. The BeagleBone won't be accessible otherwise. There are four methods to connect to the board: USB Serial, FTDI Serial, TCP over USB and Ethernet. NOTE: When you connect to the board the default root password is blank so just hit return to login to the board. Several /dev/tty.usbmodem* devices should be present when the board is plugged in via the mini-USB cable. only /dev/tty.usbmodem1d113 connected for me. Your milage may vary at this point. Alternatively you can use a 3.3V FTDI-to-USB cable to connect to the debug (J1) header block. Pin 1 on the cable is the black wire and connects to pin 1 on the board, the pin with the white dot next to it. 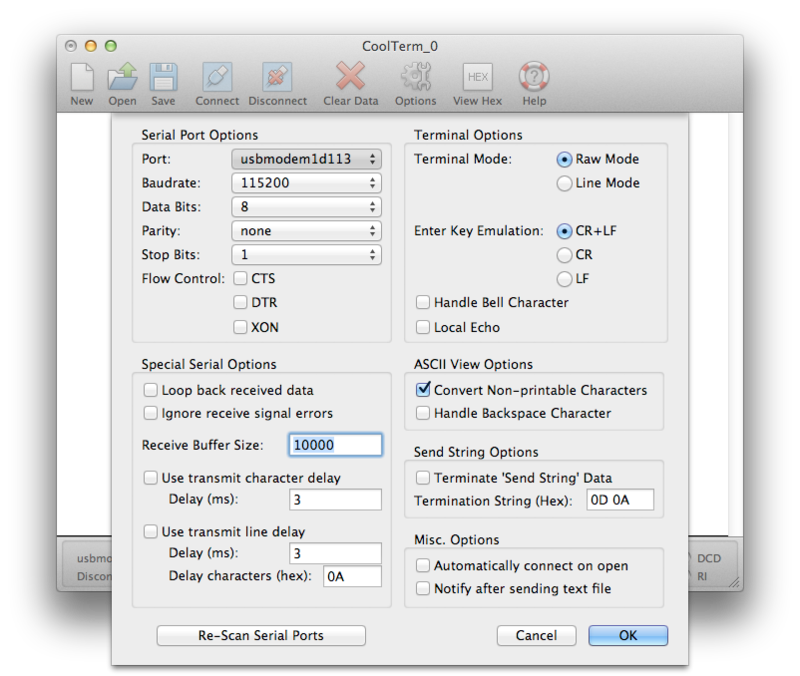 Open up CoolTerm again and you can connect to your board at 115,200 8-N-1 (Local Echo should be off) via the usbserial port offered by the cable, e.g. While I've had this method up and working, I've had intermittent luck with it - USB Serial seems to be more reliable once you have the FTDI drivers installed and working on your Mac. Plug an Ethernet cable into the jack on the board. After a moment the two lights on the jack (green and yellow) should go live and indicate that it is on the network. You can either login to your board via one of the methods above to find out what its IP address is, or check your router. If your router is capable you might want to configure it so that the BeagleBone's IP address is fixed in future and that it's got a local name that you can use rather than a raw IP address. Download the latest image of Debian Wheezy, currently that debian-wheezy-7.2-armhf-3.8.13-bone30.img.xz. The image comes as a .xz file. You can install the XZ Utils which will let you unzip the compressed archive by using MacPorts or Homebrew. After decompression is should be around 3.4GB, so you will need a micro SD card at least 4GB in size to handle the image. Go ahead and insert the microSD card in its adaptor into your Macbook. Open up a Terminal window and type df -h, remember the device name for your micro SD Card. In my case it's /dev/disk1. We'll need to use the raw device, /dev/rdisk1. if the above command report an error "dd: bs: illegal numeric value", change bs=1m to bs=1M. The card should automatically remount when dd is done. Power the BeagleBone Black down and locate the "User Boot" button. It's located on the top side of the board, directly above the micro SD card slot which is located on the reverse side along with the mini and micro USB sockets. 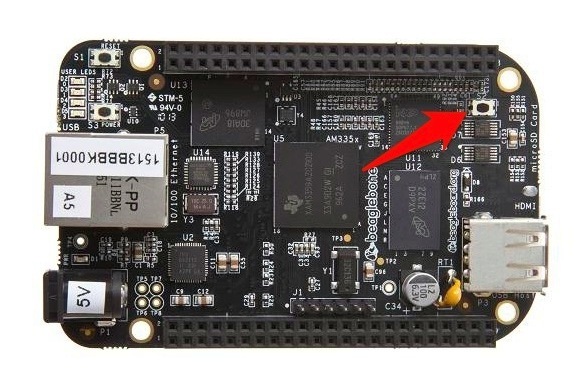 The BeagleBone Black will try to boot the internal Angstrom image by default. To boot from our SD Card, you’ll need to hold down the User Boot button while powering-on the board. You should see two of the blue lights come on. At this point you can let go of the User Boot button. NOTE: Do not hold the User Boot button down too long as the board will attempt to flash the contents of the card to the internal eMMC. Take your finger off the button when two of the blue LEDs are illuminated. If you see all four, you've held your finger on the button too long. NOTE: If you don't see any lights come on, then it is usually because of a power issue - if you are powering over USB from your computer then try connecting to another power supply such as a USB charger. When it boots the Beaglebone Black should bring up a sshd server, go to your router and find out the board's IP address. If your router is capable you might want to configure it so that the board's IP address is fixed in future and that it's got a local name that you can use rather than a raw IP address. In any case connect to the Beaglebone Black with ssh. The username is "debian" and the password is "debian". NOTE: The "root" account is disabled by default, access to root-privileges is via sudo only. NOTE: YOU SHOULD CHANGE THE DEFAULT PASSWORD THE FIRST TIME YOU LOGIN TO THE BEAGLEBONE BLACK. With the SD Card present in the microSD slot the Beaglebone Black will now boot into Debian whenever the User Boot button is held as the power is turned on. If you do not hold the User Boot button down on boot the into the default Angstrom distribution which is still present on the internal eMMC. This can get fairly tedious. If you want you can flash the image we've just booted onto the internal eMMC. Once the default Angstrom image is replaced, you won't have to hold down the User Boot button again if there is an SD Card present. To test it has worked you should un-plug the power supply, remove the microSD card and then connect the power again. It should boot back up into Debian. From this point, to boot from the SD card you simply need to place the card in the microSD slot and connect the power. No more holding down the User Boot button. One of the main reasons to boot from the SD card rather than the internal eMMC image is that we need more room to work and right now the prebuilt Debian image is sized to fit neatly into the internal eMMC space. However the image can be resized to take full advantage of additional space available on our SD card. and now we've altered the partition table go ahead and reboot. The filesystem on /dev/mmcblk0p2 is now 952832 blocks long. NOTE: The booted device is always device 0, i.e. mmcblk0. The internal eMMC always has the mmcblkXboot0 and mmcblkXboot1 entries. If the device is booted from eMMC the entries will be mmcblk0boot0 and mmcblk0boot1. If the device is NOT booted from eMMC the entries will be mmcblk1boot0 and mmcblk1boot1. We need to update the list of repositories, and upgrade to the latest packages, before proceeding. The default package served by apt-get on the current version of Whezzy is Node.js 0.6.19~dfsg1-6. Which is horribly out of date. We're going to have to build from the GitHub repository. git config --global user.name "Alasdair Allan"
change directory and switch to v0.10.22 release. This will take a long time, so go make a coffee or a toasted sandwich. NOTE: There is a bug in the snapshot feature of the V8 engine and you must disable it. Building with snapshot turned on appears to work, however the binaries will seg fault at run time. this will be needed if we run into problems and need to rebuild any add on modules with code changes. This will take a while, although nothing like as long as the node.js installation. NOTE: Current testing is using the IOGEAR GBU521 Adaptor, however other adaptors have been tested and appear to work. and you should see any Bluetooth LE peripherals that are within range, e.g. Hit ^C to stop the scan. This will take a while. Go make coffee. Then follow these instructions for starting the steward. this script starts the steward at boot time. There are times when you'll want to clone your Beaglebone SD Card. The easiest way to do this is shutdown the Beaglebone, take the card out, and insert it into your Macbook. IOpen up a Terminal window and type df -h, remember the device name for your SD Card. In my case it's /dev/disk1. We'll need to use the raw device, /dev/rdisk1. if the above command report an error "dd: bs: illegal numeric value", change bs=1m to bs=1M. A disk image will be created on your Desktop. You can use this image as you would a normal install image for the Beaglebone. NOTE: The size of the image will be dependent on the size of the SD Card you are using on the Beaglebone.